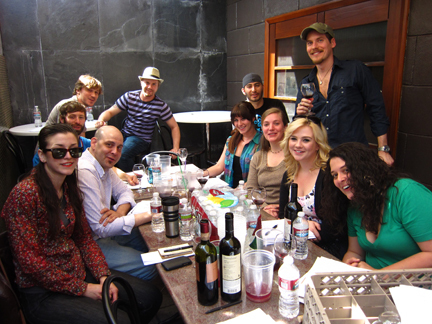 Above: Our very first staff wine training at Sotto in Los Angeles when the restaurant opened more than two years ago. What a thrill for me and Tracie P to learn that S. Irene Virbila has named the wine program at Sotto, where I co-curate the list, one of the “best” in Los Angeles! From day one, my co-curator and bromance Rory Harrington and I have taken a very radical approach to the list at Sotto and we’ve never strayed from that course. We have always featured food-friendly wines that truly reflect the grapes with which they are made, the place where those grapes are grown, and the people who grow them. But like a tree that falls in the forest when no one is there to hear it thump, our wine list wouldn’t have any meaning if guests didn’t enjoy our selections. 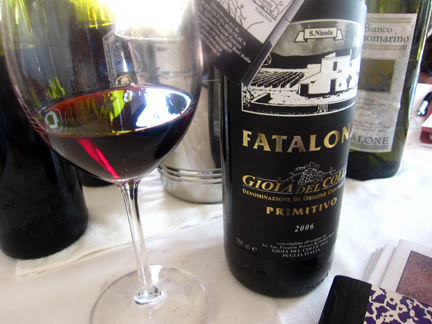 More than two years into this project, I never stop being thrilled by watching someone taste an old Taurasi, Gaglioppo, or Gioia del Colle Primitivo for the first time. Of all the rewards that this experience has delivered, this has been the greatest by far. I’m currently on paternity leave from my monthly visits to the restaurant. But I’ll be back again in September and we already have some interesting wine events lined up for the fall. Georgia P has so much fun in restaurants… she LOVED Sotto last night in Los Angeles (where daddy works). Fusilli di grano arso al ragù di coniglio e porcini, toasted wheat fusilli with rabbit and porcini ragù. This dish was tough to photograph but amazing, balanced in its flavors and textures, and the pasta cooked perfectly al dente. This might be my top dish for 2012. Rapini (cime di rapa) con collatura, broccoli raab with garum (anchovy sauce), so simple and so delicious. Sardinian pane frattau, classic Sardinian pane carasau (crunchy, thin, savory flatbread) that has been soaked in water, layered (in this case) with pork innards, topped with an egg (look at the color of that yolk! ), and baked. This dish will definitely go in my top dishes of 2012 post at the end of the year. Many erroneously believe that frattau means fretta or hurry in Sardinian. But it’s more likely that it means grated, possibly akin to franto. 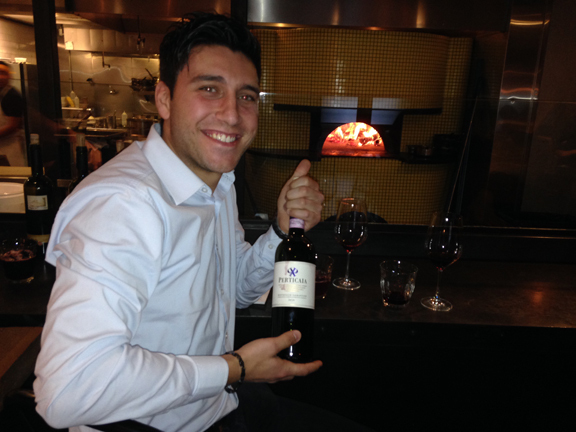 Amazing meal… truly amazing… a note on the wine will follow later today… stay tuned! I was very geeked to catch the last set of my good friend Mike Andrews’ Wednesday night residency at the Fold at Bootleg Bar in LA last night after my shift on the floor at Sotto. Mike and his music continue to inspire me (as they have since we were teenagers in La Jolla). We took Georgia P to our favorite Japanese restaurant in Los Angeles these days, K-ZO. Since I began commuting monthly to Los Angeles to work with Sotto where I curate the wine list, I’ve become obsessed with K-Zo, a wonderful Japanese restaurant on Culver Blvd. I took Giovanni there yesterday for lunch before we headed to the restaurant. It was fantastic. Chef/owner Keizo Ishiba (above) is so cool and I’ve waited on him at Sotto. Super nice guy and a master in his kitchen. Can’t recommend it highly enough. Giovanni and I are heading to Napa today… Stay tuned! The Mitzvah Store (across the street from Sotto).